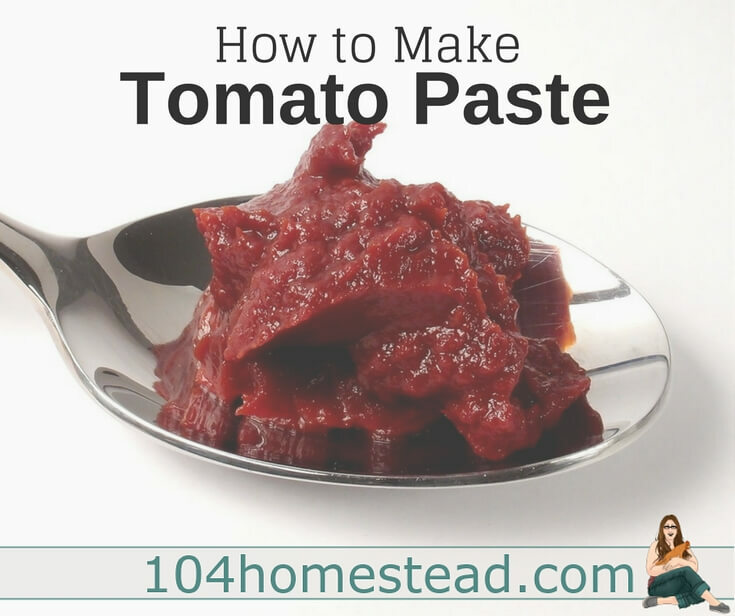 Tomato paste is a wonderful thing to have on hand. It’s thick and rich with flavor. We use it for thickening spaghetti sauce (which can be a challenge when you make your own homemade spaghetti sauce***), enriching the flavors in stews and soups, and for adding some zing to grilled cheese sandwiches. Have you tried tomato paste on grilled cheese? It’s delicious. You can even make your own ketchup with it. Grow your own tomatoes and you can make all sorts of things! The meatier the tomato, the better. 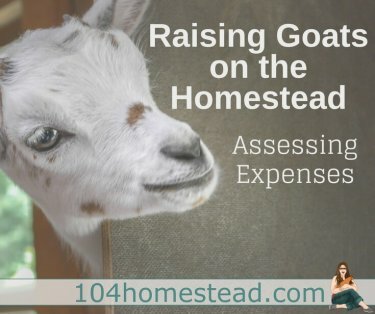 We often use Amish Paste, Roma, or a combination of the two, but there are a lot of good varieties. Remember, don’t judge a tomato by its taste raw. Many of the paste tomatoes taste rather blah when uncooked, but their flavor intensifies as they’re cooked. Diced tomatoes can also be used, but I haven’t done it myself. Just puree the diced tomatoes in a blender or food mill and skip to the baking section of the instructions. Chop tomatoes into quarters. Preheat the oven to 350ºF. Combine the chopped tomatoes and 1/4 cup olive oil in a large saucepan and bring to a simmer. Cook until the tomatoes are soft and the peels begin to detach from the tomato flesh. You can skip this step if your tomatoes are over-ripe. Just peel them using this easy method and continue to the next step. Push the warm tomatoes through a food mill (this is my favorite one) to separate the seeds and skins from the tomato pulp. If you don’t have a food mill, you can use a sieve and wooden spoon or pounder to push the pulp through. Stir the salt and citric acid into the tomato pulp until it’s well mixed. Discard, dehydrate, or compost the skins. Divide the tomato pulp between two large, rimmed baking sheets. Place the baking sheets in the preheated oven. Check the tomatoes every half hour, stirring the paste and rotating the baking sheets so they cook down evenly. When the paste has cook down to the point where it no longer fills the trays you can combine the contents of the two pans into one and continue to bake. 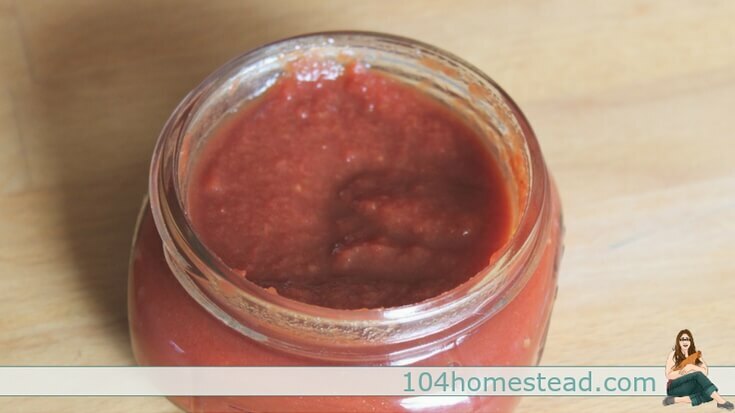 The paste is done when shiny and brick-colored, and it has reduced by more than half. There shouldn’t be any remaining water or moisture separating from the paste at this point. Exact baking times will depend on how juicy of your tomatoes were. 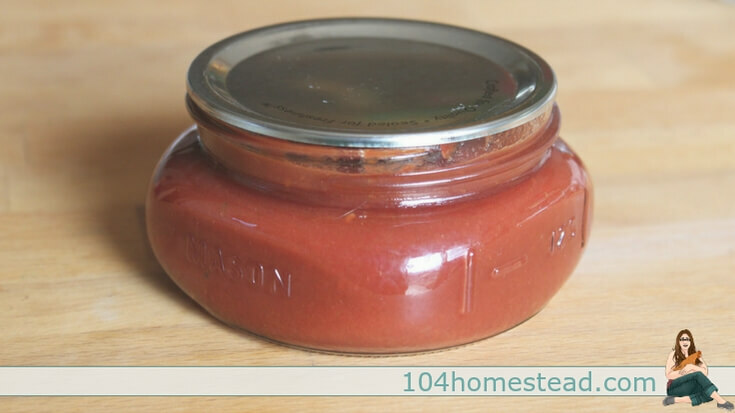 Tomato paste is a wonderful thing to have on hand. It’s thick and rich with flavor. We use it for thickening spaghetti sauce, enriching the flavors in stews and soups, and for adding some zing to grilled cheese sandwiches. Combine the chopped tomatoes and 1/4 cup olive oil in a large saucepan and bring to a simmer. Cook until the tomatoes are soft and the peels begin to detach from the tomato flesh. 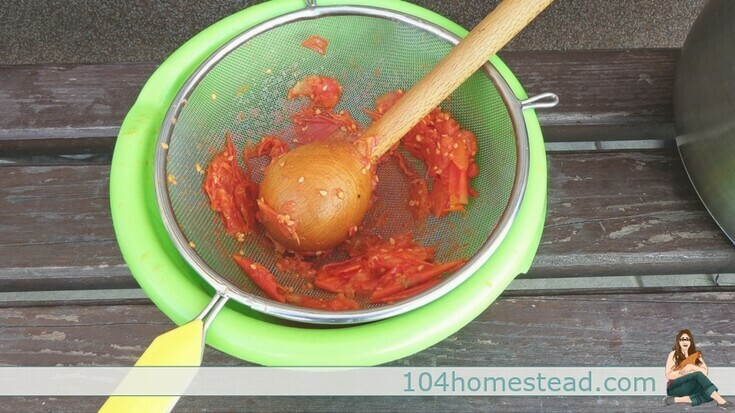 Push the warm tomatoes through a food mill to separate the seeds and skins from the tomato pulp. Discard, dehydrate, or compost the skins. Stir the salt and citric acid into the tomato pulp until it’s well mixed. Divide the tomato pulp between two large, rimmed baking sheets. Place the baking sheets in the preheated oven. Check the tomatoes every half hour, stirring the paste and rotating the baking sheets so they cook down evenly. The paste is done when shiny and brick-colored, and it has reduced by more than half. There shouldn’t be any remaining water or moisture separating from the paste at this point. Exact baking times will depend on how juicy of your tomatoes were. Divide finished paste into quarter pint jelly jars, leaving 3/4″ head space. Process for 15 minutes. For water bath canning tips, check out these FAQs about canning. Divide paste into clean half or quarter pint jelly jars. Top each jar with a thin layer of olive oil and place in either the refrigerator or the freezer. As long as you keep it covered with olive oil, it will keep in the fridge for 3-4 weeks or frozen for up to 9 months. 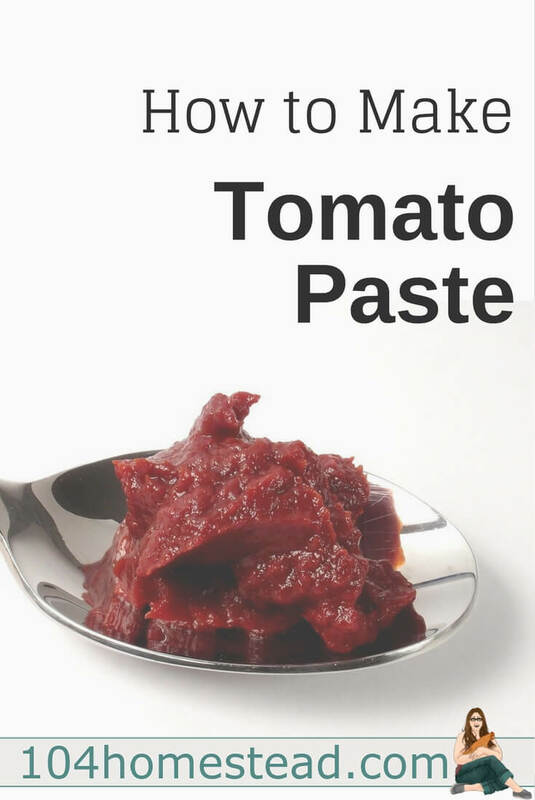 Is tomato paste the same as a puree? The concept of the two is the same. They are tomatoes that have the skins and seeds removed and they are broken down into a pulp. The major difference is the consistency. A puree still has a lot of moisture in it. Paste has the majority of the moisture removed. If you have a recipe that calls for puree you can substitute paste for it. Just thin your paste with water until you reach your desired consistency and flavor. *** Tip: To further thicken homemade spaghetti sauce, set aside your tomato skins while you’re peeling and toss them into a dehydrator or oven on low. Once their crispy, run them through a coffee grinder to make a powder. Sprinkle this powder in your sauce and it will thicken it up. Why do we always have to separate the skin and seeds? I would have preferred pureeing everything.